Objectives: Efficacy of an ideal antimicrobial agent depends on its ability to eliminate microorganisms while causing minimal toxicity to host cells. The purpose of this study was to assess the effect of ethanolic and water extracts of Salvadora persica (SP) on proliferation and viability of human dental pulp stem cells (hDPSCs). Materials and Methods: In this in-vitro study, the effects of seven concentrations of ethanolic and water extracts of SP (ranging from 5.75 mg/ml to 0.08 mg/ml) on hDPSCs were evaluated using the 3-(4, 5-dimethylthiazol-2-yl)-2, 5-diphenyl tetrazolium bromide assay. The results were analyzed using one-way ANOVA and Tukey's post-hoc test. P < 0.05 was considered statistically significant. Results: Water extract of SP only had cytotoxic effect at 5.75 mg/ml concentration; and caused significant cell proliferation at 1.43-0.08 mg/ml concentrations at 24 h (P < 0.05). At 48 h, only 0.17 and 0.08 mg/ml concentrations caused significant cell proliferation (P < 0.05). Ethanolic extract of SP at 5.75-1.43 mg/ml concentrations showed severe cytotoxic effects at 24 and 48 h. Other concentrations had no significant effects on cells (P > 0.05). Conclusion: The highest concentrations of both water and ethanolic extracts of SP had cytotoxic effects on hDPSCs. Water extract of SP has favorable effects on cell proliferation at specific concentrations in a time-dependent manner. Since SP has shown to have an antibacterial effect, it could also be used as an intracanal medicament, but it is suggested that its effect in root canal as an intracanal medicament needs to be evaluated in future study. Antibacterial properties of SP have been widely investigated. However, the studies on the effects of this natural toothbrush on cells are infrequent. However, in the case of these materials, in addition to antimicrobial effect, the biocompatibility too has to be given due consideration. Hence, considering the risk of exposure of dental pulp cells to this material in highly carious teeth, this study aimed to assess the cytotoxic effect of SP's extract on cultured human dental pulp stem cells (hDPSCs). Salvadora persica chewing sticks were obtained fresh from the local market in Makkah city, Saudi Arabia and stored in a freezer (−80°C) until the experiment. The sticks were chopped into small pieces and ground by an electric grinder (National, Japan). Twenty-five gram of miswak powder was successively extracted using the maceration method in 250 ml of double distilled water and 250 ml of ethanol 80% on a shaker at room temperature for 48 h. The extract solutions were then filtered with Whatman No. 4 filter paper. Using a rotary evaporator (Heidolph, Germany), the solutions were completely concentrated and the obtained sticky pastes were stored at 4°C until use. In this study, in order to assess the cytotoxic effects of ethanolic and water extracts of SP on hDPSCs, different concentrations of the extracts were prepared by twofold serial dilution with the Dulbecco's Modified Eagle Medium (DMEM) (Gibco, USA). These concentrations were as follows: 5.75; 2.87; 1.43; 0.71; 0.35; 0.17, and 0.08 mg/ml (the highest concentration was determined by conduction of a pilot study). The elutes were then sterilized using 0.20 μm pore size filters (Acrodisc syringe filter, USA), supplemented with 10% fetal bovine serum (FBS) (Gibco, USA), and 1% antibiotic (Gibco, USA) and used immediately for cytotoxicity testing. Isolation and culture of hDPSCs were performed as we reported later. Briefly, human teeth were extracted for valid clinical reasons and collected from the Oral Surgery Department of Faculty of Dentistry, Shahid Beheshti University of Medical Sciences after obtaining verbal informed patient consent according to approval of the ethical committee. Dental pulp tissue extracted from the teeth was cut into small pieces and put in a test tube containing collagenase I (3 mg/ml) and dispase (4 mg/ml). It was left for 30-60 min at 37°C, pelleted by centrifugation 1200 g for 10 min, resuspended in DMEM containing 10% FBS and 1% antibiotic, then transferred to a 25 cm 2 cell culture flask (SPL, South Korea) and incubated at 37°C under 5% CO 2 and 95% humidity. The media was refreshed every 3 days and the sub-culturing was done after the cells reached confluence. The fourth passage cells were used for this experiment. After proliferation and reaching 80% confluence, cells were harvested using 0.25% trypsin (Sigma-Aldrich, St. Louis, MO, USA) and counted using a Neubauer chamber. Then, 3000 cells/100 μl culture medium (containing 10% FBS and 1% antibiotic) was added to each well of a 96-well plate (SPL, South Korea). Two plates were allocated for water extract and two for ethanolic extract. Peripheral wells of the plates were considered blank and only contained pure culture medium. Plates were incubated in a humidified atmosphere of air and 5% CO 2 , at 37°C. After 24 h of cell culture, the medium in each well of plates was replaced with 100 μl of prepared elutes of extracts (ranged from 5.75 mg/ml to 0.08 mg/ml in a series of two-fold dilutions) or sterile distilled water (which is 100% toxic for cells) as the positive control and DMEM containing 10% FBS and 1% antibiotic as the negative control group (n = 6 in each group) and stored in an incubator at 37°C with 5% CO 2 for 24 and 48 h.
5-diphenyl tetrazolium bromide (MTT) assay was performed at 24 and 48 h following the treatment of cells with different elutes of SP extracts. The cells were washed with phosphate buffered saline (PBS) (Gibco, USA). 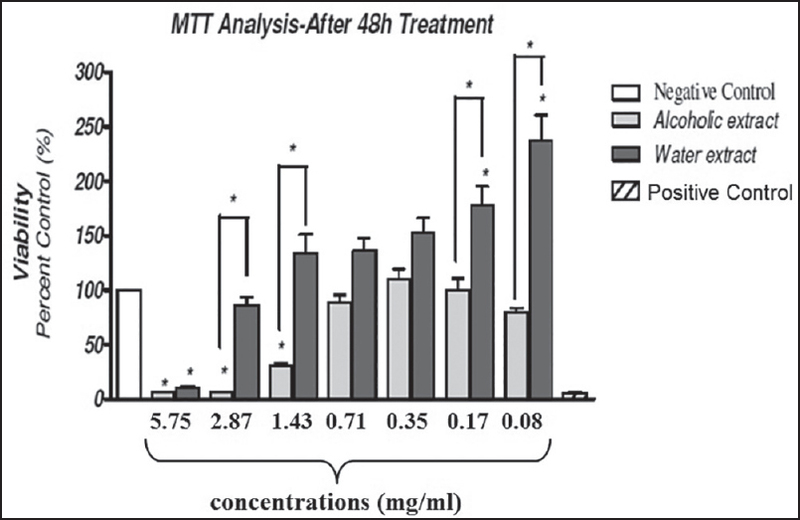 The MTT solution was prepared at 5 mg/ml concentration in PBS and diluted with FBS-free culture medium in a 1/10 ratio; 100 μl of this solution was added to each well. Next, plates were incubated for another 3-4 h. During this time period, mitochondrial dehydrogenases reduce the yellow MTT dye (tetrazolium salt) into the insoluble blue Formazan in the viable cells. The overlaying culture medium was gently removed and 100 μl of dimethyl sulfoxide (Gibco BRL, Grand Island, NY, USA) was added to the wells to dissolve the formazan crystals. Cell viability (%) = 100 (OD mean of test groups/OD mean of negative control group). The percentage of cell viability over 90% indicated nontoxicity, while the amounts between 60% and 90%, 30-60% and <30%, indicated mild, moderate, and severe toxicity, respectively. The data were analyzed with the GraphPad Prism software (GraphPad Software, San Diego, CA, USA). The mean and standard deviations were calculated. One-way ANOVA was applied for statistical analysis of data and post-hoc Tukey's test was used for multiple comparisons using the data resulted from three repeated experiments. Level of significance was set at P < 0.05. [Figure 1] and [Figure 2] illustrate the influence of the different elutes of two extracts on the growth of the hDPSCs. Ethanolic extract of SP: As seen in [Figure 1], the cells exposed to 5.75, 2.87, and 1.43 mg/ml concentrations of ethanolic extract resulted in 95.58%, 93.88%, and 70.90% cell viability reduction compared to the negative control group, respectively and these reductions were statistically significant in comparison to negative control group (P < 0.05). The mentioned three concentrations were not significantly different from the positive control group (distilled water) (P > 0.05) and were considered sever cytotoxic. Concentrations from 0.71 mg/ml to 0.08 mg/ml caused 20.20-19.80% reduction in cell viability and no significant difference was noted with the negative control group (P > 0.05). Comparison of various concentrations of water extract with the negative control group at 24 h revealed that 5.75 mg/ml concentration of water extract resulted in 79% reduction in cell viability compared to the negative control group and this reduction was statistically significant (P < 0.05). However, this concentration showed no significant difference with the positive control group (distilled water) (P > 0.05). Thus, this concentration was found to be severely cytotoxic. The concentration of 2.87 mg/ml caused proliferation of cells (23.17% increase compared to the negative control group); but this increase was not statistically significant compared to the negative control group (P > 0.05). However, the difference with the positive control group (distilled water) was significant (P < 0.05). Thus, this concentration was not cytotoxic. Concentrations of 1.43-0.08 mg/ml of water extract caused significant increase in cell proliferation by 63.83%, 71.25%, 73.83%, 86.50%, and 111.8%, respectively compared to the negative control group (P < 0.05). The differences with the positive control group were significant as well (P < 0.05). Positive control group (distilled water) showed 95.40% reduction in cell count compared to the negative control group; which indicates severe cytotoxicity of distilled water. Ethanolic extract of SP: As seen in [Figure 2], comparison of various concentrations of ethanolic extract with the negative control group at 48 h revealed that 5.75, 2.87 and 1.43 mg/ml concentrations of ethanolic extract resulted in 93.75%, 93.50%, and 70.17% cell reduction compared to the negative control group and these reductions were statistically significant (P < 0.05). 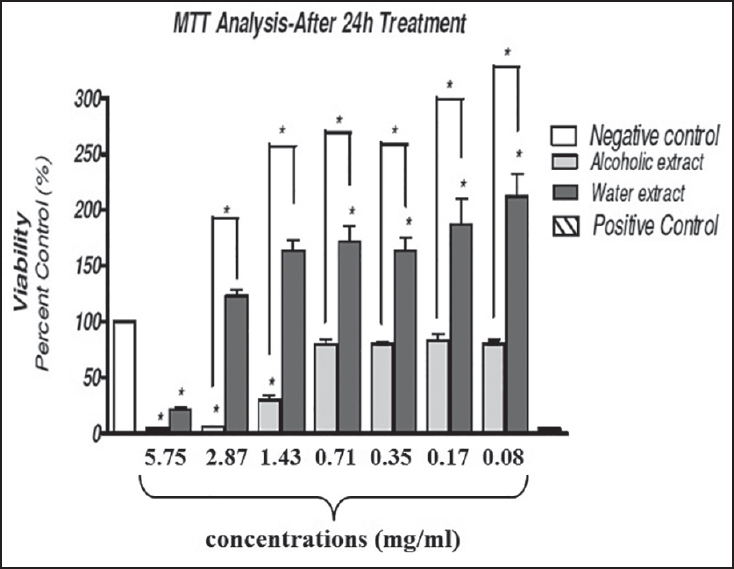 The mentioned three concentrations were not significantly different from the positive control group (distilled water) (P > 0.05) and maintained their severe cytotoxicity for 48 h. Concentrations from 0.71 mg/ml to 0.08 mg/ml showed no significant difference with the negative control group (similar to the status at 24 h) (P > 0.05); indicating that these concentrations of ethanolic extract were not cytotoxic by up to 48 h.
Comparison of various concentrations of water extract of SP with the negative control group at 48 h revealed that 5.75 mg/ml concentration of water extract resulted in 93.75% reduction in cell count compared to the negative control group and this reduction was statistically significant (P < 0.05). Thus, this concentration remained severely cytotoxic by up to 48 h. The concentrations of 2.87-0.35 mg/ml increased cell proliferation by 34, 36, and 53%, respectively compared to the negative control group; these increases were not significant compared to the negative control group (P > 0.05), but statistically significant compared to the positive control group (distilled water) (P < 0.05). Therefore, these concentrations were not cytotoxic. The two low concentrations of water extract (0.17 mg/ml and 0.08 mg/ml) caused 78% and 137% increase in cell proliferation, respectively at 48 h, which were statistically significant compared to the negative control group (P < 0.05). In both extracts, no significant time-dependent difference in their effects on cell viability at the mentioned two time points was found (P > 0.05). However in water extract, concentrations with favorable effects on cell proliferation at 24 h decreased cell viability after 48 h (except for 0.08 mg/ml), however this decrease was not statistically significant (P > 0.05). Comparison of each concentration between water and ethanolic extracts at 24 h revealed that from 2.87 mg/ml concentration, the differences between the two groups were significant (P < 0.05) indicating significantly higher cell proliferation in water extract group. Comparison of each concentration between the two groups of water and ethanolic extracts at 48 h revealed that the 2.87 mg/ml and 1.43 mg/ml concentrations of ethanolic extract, which were cytotoxic, were significantly different from the same concentrations of water extract in terms of cytotoxicity (P < 0.05). The 0.71 mg/ml and 0.35 mg/ml concentrations were not significantly different, but 0.17 mg/ml and 0.08 mg/ml concentrations of water extract caused a significant cell proliferation compared to similar concentrations of ethanolic extract (P < 0.05). Considering the unfavorable side effects of chlorhexidine (CHX),  many attempts have been made to find natural oral care products. Antibacterial effects of SP have been confirmed in several studies. , Aside from the antibacterial properties, the effect of SP on living cells must be thoroughly investigated as well for its use in the oral environment. Effective dose of a substance is different in microbial and cellular tests and an effective concentration against bacteria may be toxic for cells. No previous study has evaluated the effect of SP extract on hDPSCs. These cells in the connective tissues of the pulp play a central role in the synthesis of the dentinal bridge in some pathologic alterations. The diffusion of SP components into pulp through the dentinal tubules should be considered as this can affect DPSCs viability. Thus, in the current study, we evaluated the cytotoxic effects of different concentrations of water and ethanolic extracts of SP on hDPSCs using the MTT assay. According to ISO10993, the MTT assay is a standard method for the assessment of cytotoxicity of materials. It determines cell viability by quantitative assessment of a metabolic product and indicates activity of mitochondria in living cells; which has a direct relationship with cell proliferation and longevity. Rajabalian et al. evaluated the cytotoxicity of SP mouthwash against cultured human and mouse cell lines in comparison to CHX using the MTT assay and reported that both Persica and CHX mouthwashes were toxic to macrophages, epithelial cells, fibroblasts, and osteoblasts in a concentration-dependent manner. Darmani et al. evaluated the effects of miswak extracts on the proliferation of mouse fibroblasts using the MTT assay and reported that water extracts of miswak enhanced the growth of fibroblasts while inhibiting the growth of cariogenic bacteria. However, Al-Fatimi et al. used neutral red and Ali et al. used alamarBlue ® for assessment of the cytotoxicity of SP. In the current study, we obtained SP extract using maceration method similar to studies by Al-Fatimi et al.,  and Ali et al. However, Abo Al-Samh and Al-Bagieh  used percolation technique. Our results revealed that high concentrations of the ethanolic extract of SP (5.75-1.43 mg/ml) caused significant reduction in cell proliferation compared to the negative control group and 0.08-0.71 mg/ml concentrations showed no significant difference with negative control group. High concentrations of the water extract of SP caused a significant reduction in cell proliferation compared to the negative control group while lower concentrations of water extract increased proliferation of hDPSCs. Increased cell proliferation as the result of exposure to water extract of SP confirms the results of previous studies indicating the optimal efficacy of miswak for improving gingival ulcers. However, our results were in contrast to those of Darmani et al. They evaluated the effect of water extract of derum and miswak on proliferation of Balb/C3T3 mouse fibroblasts and reported a significant increase in cell proliferation at all concentrations of both materials compared to the control group (P < 0.0005). In their study, 100% concentration of extracts caused highest proliferation of cells; whereas, in our study, water extract of SP at very low concentrations increased cell proliferation. Such difference in results may be due to errors in extract preparation in the study by Darmani et al. In their study, the powder of miswak (15 g) was mixed with distilled water (100 ml), filtered and the obtained nondried extract was used as 100% concentration. Next, seven other concentrations were prepared of this extract. However, the extract must be dried first and then different concentrations should be prepared of the dry extract. Moreover, type of cells used may also cause differences in results. In a study by Rajabalian et al. Persica had the lowest cytotoxicity against J744 and highest cytotoxicity against MRF; such difference in cytotoxicity of persica against different cells indicates that type of cell significantly affects the level of cytotoxicity. Furthermore, in their study, 0.5% concentration of persica mouthwash had cytotoxic effects on all types of cells. At all concentrations, persica mouthwash had significantly higher toxicity in the absence of fetal calf serum (FCS). Decreased toxic effect of persica in the presence of FCS may be due to the bonding of toxic agents in the mouthwash to serum proteins. It appears that toxic agents in persica exert their effect via their irreversible bond to cell proteins and impairing their function. In the current study, a significant difference was noted between the effects of ethanolic and water extracts and this difference may be due to different chemical compositions of these extracts. It appears that compounds released in alcohol have greater toxic effects. In a study by Al-Fatimi et al. cytotoxicity of methanol and water extracts of 30 medicinal plants used in the Yemeni ethnomedicine against FL-cells (human amniotic epithelial cells) was assessed and it was reported that methanol extract of miswak at concentrations higher than 1 mg/ml was cytotoxic for 50% of cells; these results were in line with our findings. However, Ali et al. evaluated the cytotoxicity of ethanolic extract of 19 plant species, used traditionally in Sudan against HT-29 human adenocarcinoma cell and L-6 rat skeletal muscle myoblast. Different concentrations of the ethanolic extract from 500 μg/ml to 0.07 μg/ml were added to cells. The results showed that concentrations higher than 0.03 mg/ml of the ethanolic extract of SP were cytotoxic. These results are in contrast to our findings. In the current study, low concentrations of ethanolic extract were not significantly different from the control group and showed no cytotoxic effect. Such controversial results may be due to the type of cells or number of cells in each well. Furthermore, we used the MTT assay while Ali et al. used the alamarBlue ® assay. Our results showed that SP's extract at very high concentrations caused a significant reduction in cell viability compared to the negative control group; these results are in accord with those of Abo Al-Samh and Al-Bagieh,  who demonstrated that high concentrations of ethanolic extract of miswak affected the morphology of cells within 2-4 h and caused cell death. However, decreased cell proliferation does not necessarily mean that miswak causes cell death; because in the mentioned study, miswak extract, and not the stick itself, was used. When miswak stick, is used, not all of its constituents are released, but when the extract is to be used in a mouthwash, toxic concentrations must be taken into account. Ethanolic solvent is often used in mouthwashes and thus, cytotoxicity of the ethanolic extract must be taken into account. In most previous studies, ethanolic extract of miswak has been evaluated; whereas, when miswak is used in the oral cavity for tooth cleaning, its constituents are dissolved in the saliva; which is composed of 80% water. Thus, the cytotoxicity of the water extract of miswak is more important for use in the oral environment. Within the limitations of this study, the highest concentrations of both water and ethanolic extracts of SP had cytotoxic effects on hDPSCs. Water extract of SP at some concentrations can enhance the proliferation of cells. Further studies are required to assess the effect of SP constituents dissolved in the saliva on cells. Preparation of SP's extract for wound healing purposes or as an intracanal irrigant in root canal therapy may be an interesting subject for future studies as well. The clinical significance of this research was to offer clinicians a better understanding regarding the biocompatibility of natural toothbrushes. Water extract of SP evaluated in this study were proven suitable for use by patients due to their effect in enhancing proliferation of dental pulp stem cells. Thus, this natural toothbrush could be considered as a material of choice in dental hygiene. Eid MA, Selim HA, Al-Shammery AR. Relationship between chewing sticks (miswak) and periodontal health. Part 1. Review of the literature and profile of the subjects. Quintessence Int 1990;21:913-7. Khoory T. The use of chewing sticks in preventive oral hygiene. Clin Prev Dent 1983;5:11-4. World Health Organization. Prevention of Diseases. Geneva: WHO; 1987. Board N. Herbs Cultivation and Their Utilization. Delhi, India: Asia Pacific Business Press Inc.; 2003. p. 329-33. Al-Otaibi M, Al-Harthy M, Söder B, Gustafsson A, Angmar-Månsson B. Comparative effect of chewing sticks and toothbrushing on plaque removal and gingival health. Oral Health Prev Dent 2003;1:301-7. Almas K, Al-Zeid Z. The immediate antimicrobial effect of a toothbrush and miswak on cariogenic bacteria: A clinical study. J Contemp Dent Pract 2004;5:105-14. Homer KA, Manji F, Beighton D. Inhibition of protease activities of periodontopathic bacteria by extracts of plants used in Kenya as chewing sticks (mswaki). Arch Oral Biol 1990;35:421-4. Sofrata A, Brito F, Al-Otaibi M, Gustafsson A. Short term clinical effect of active and inactive Salvadora persica miswak on dental plaque and gingivitis. J Ethnopharmacol 2011;137:1130-4. Sofrata AH, Claesson RL, Lingström PK, Gustafsson AK. Strong antibacterial effect of miswak against oral microorganisms associated with periodontitis and caries. J Periodontol 2008;79:1474-9. Akhtar J, Siddique KM, Bi S, Mujeeb M. A review on phytochemical and pharmacological investigations of miswak (Salvadora persica Linn). J Pharm Bioallied Sci 2011;3:113-7. Almas AK, Almas K. Miswak (Salvadora persica chewing stick): The natural toothbrush revisited. Odontostomatol Trop 2014;37:27-39. Khatak M, Khatak S, Siddqui AA, Vasudeva N, Aggarwal A, Aggarwal P. Salvadora persica. Pharmacogn Rev 2010;4:209-14. Sofrata A, Santangelo EM, Azeem M, Borg-Karlson AK, Gustafsson A, Pütsep K. Benzyl isothiocyanate, a major component from the roots of Salvadora persica is highly active against Gram-negative bacteria. PLoS One 2011;6:e23045. Sofrata A, Lingström P, Baljoon M, Gustafsson A. The effect of miswak extract on plaque pH. An in vivo study. Caries Res 2007;41:451-4. Tabatabaei FS, Jazayeri M, Ghahari P, Haghighipour N. Effects of equiaxial strain on the differentiation of dental pulp stem cells without using biochemical reagents. Mol Cell Biomech 2014;11:209-20. Gürgan CA, Zaim E, Bakirsoy I, Soykan E. Short-term side effects of 0.2% alcohol-free chlorhexidine mouthrinse used as an adjunct to non-surgical periodontal treatment: A double-blind clinical study. J Periodontol 2006;77:370-84. Alali F, Al-Lafi T. GC-MS analysis and bioactivity testing of the volatile oil from the leaves of the toothbrush tree Salvadora persica L. Nat Prod Res 2003;17:189-94. Noumi E, Snoussi M, Hajlaoui H, Valentin E, Bakhrouf A. Antifungal properties of Salvadora persica and Juglans regia L. extracts against oral Candida strains. Eur J Clin Microbiol Infect Dis 2010;29:81-8. Murray PE, Garcia-Godoy F. Stem cell responses in tooth regeneration. Stem Cells Dev 2004;13:255-62. ISO B. 10993-5: Biological Evaluation of Medical Devices. Tests for in vitro Cytotoxicity; 1999. Rajabalian S, Mohammadi M, Mozaffari B. Cytotoxicity evaluation of Persica mouthwash on cultured human and mouse cell lines in the presence and absence of fetal calf serum. Indian J Dent Res 2009;20:169-73. Darmani H, Nusayr T, Al-Hiyasat AS. Effects of extracts of miswak and derum on proliferation of Balb/C 3T3 fibroblasts and viability of cariogenic bacteria. Int J Dent Hyg 2006;4:62-6. Al-Fatimi M, Wurster M, Schröder G, Lindequist U. Antioxidant, antimicrobial and cytotoxic activities of selected medicinal plants from Yemen. J Ethnopharmacol 2007;111:657-66. Ali H, König GM, Khalid SA, Wright AD, Kaminsky R. Evaluation of selected Sudanese medicinal plants for their in vitro activity against hemoflagellates, selected bacteria, HIV-1-RT and tyrosine kinase inhibitory, and for cytotoxicity. J Ethnopharmacol 2002;83:219-28. Al-Samh DA, Al-Bagieh N. A study of the antimicrobial activity of the miswak ethanolic extract in vitro. Biomed Lett 1996;53:225-38. Sakaguchi RL, Powers JM. Craig′s Restorative Dental Materials. 13 th ed. St. Louis: Mosby Elsevier; 2012.